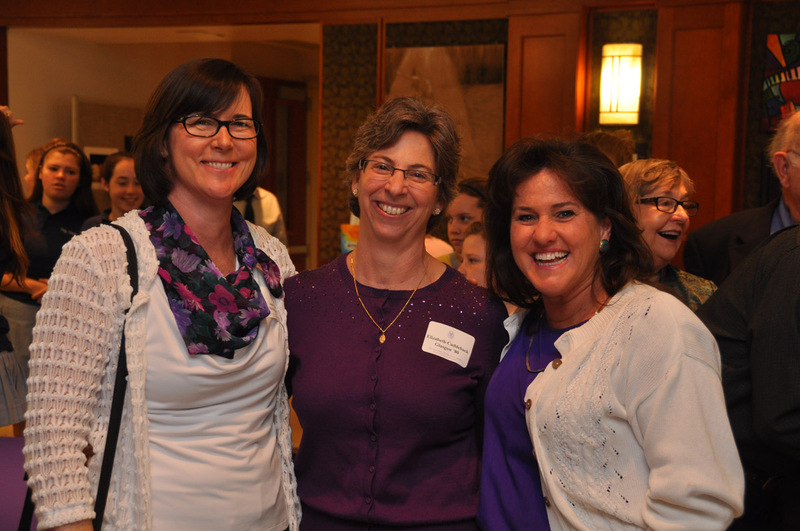 Each year, The Academy of the Holy Cross recognizes alumnae-athletes and coaches for their outstanding achievement in athletics. The prestige of a Washington Catholic Athletic Conference Championship is a mark of high honor, demonstrating a team’s distinct ability to compete at a superior level. The Academy of the Holy Cross’ 2004 and 2005 Tennis teams exhibited a mark of superiority with the WCAC Finalist and Championship titles. In the 2004 season the Tartans compiled a 9-2 record under coach Suzy Ornstein-Fleming and captured the second-place spot in the WCAC. Angela Fuccillo ’06 was named First Team All-Gazette in 2004 and Courtney Radcliff ’06 received All-Gazette Honorable Mention. In 2005 the team completed their season with a 14-0 record, winning six of nine matches in the championship finals. Angela and Maria Fuccillo ’09 were named First Team All-Gazette in 2005 in both the Singles and Doubles category. The prestige of a Washington Catholic Athletic Conference Championship is a mark of high honor, demonstrating a team’s distinct ability to compete at a superior level. To earn that record for five consecutive years is an accomplishment well beyond stellar. Under the leadership of Coach Jim Buchanan and Assistant Coach Fred Prince, these teams established a Lacrosse legacy at Holy Cross and also raised the expectation for a higher level of play within in the WCAC. 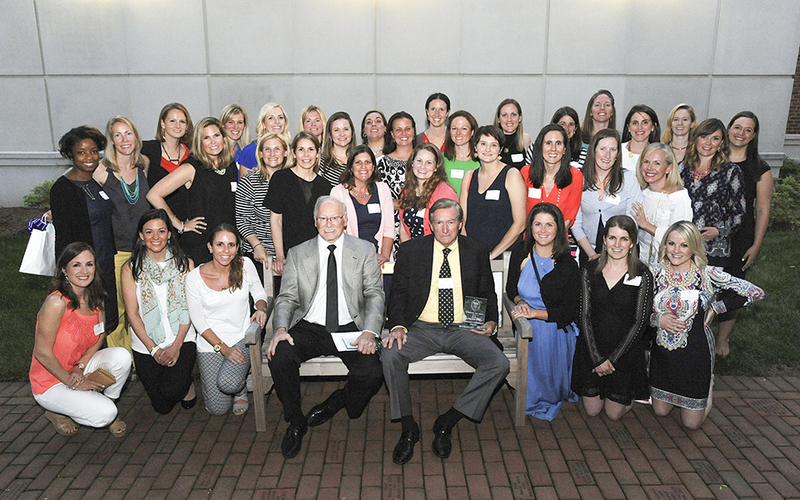 The Academy of the Holy Cross inducted the 2001 Varsity Softball team players and coaches into the Athletic Hall of Fame on Friday, May 8. Holy Cross welcomed back 14 of the 17 players and the two assistant coaches for the evening reception and ceremony. Many of the players had members of their families attend including spouses, children, siblings, and parents. The 2001 Varsity Softball team won the WCAC Championship with a 15-11 record. They entered the tournament as the fourth seed and beat Good Counsel and Bishop O’Connell in the quarterfinal and semifinal. The then beat St. John’s 1-0 in the championship game. To date, they are the only Holy Cross Softball team to win a WCAC Championship. The ceremony included words of welcome and opening prayer from President Katy Prebble. Alumnae Relations Director Megan Hendon Harbold ’00 gave the origin of the Holy Cross Athletic Hall of Fame, now in its fourth year. Kim McCall ’01 spoke on behalf of her father Coach Terry McCall who was unable to be present. Coaches Tom Horrigan and Terry Wisniewski also shared their memories and appreciation for the accomplishments of the 2001 team. As Athletic Director Lisa Schrader read the names of the inductees, Sister Grace Shonk, CSC presented the awards. To conclude the evening, Katy Prebble shared news of the upcoming plans for a new turf field, which will include a softball diamond with the attendees. In previous years, the Academy has inducted the 1984-1986 Varsity Soccer team (2014), four All-American Swimmers from the 1970s (2013), and the 1976-1982 Varsity Basketball teams (2012) to the Athletic Hall of Fame. On Friday, May 9, members of the Holy Cross 1984, 1985 and 1986 Varsity Soccer teams, including coaches and assistant coachers, were inducted into the Athletic Hall of Fame. Family and friends, including the parents of several of the players, joined in the celebration saluting the team members. Former Faculty member and Soccer Coach Sandy Young also attended the event and spoke about the teams’ accomplishments. Sandy Young also spoke of her experience with the honorees. She noted how important it was for the athletes to play as a team in her program. She also shared about the spirit of the teams and the great attitude they had working together. The honorees were thrilled to have Coach Young with them to celebrate their honor. Each of the honorees in attendance received an engraved frame with team photos presented by Sister Grace Shonk, CSC. To be considered for the Athletic Hall of Fame, nominees must have demonstrated outstanding performance within The Academy of the Holy Cross’ athletic program. 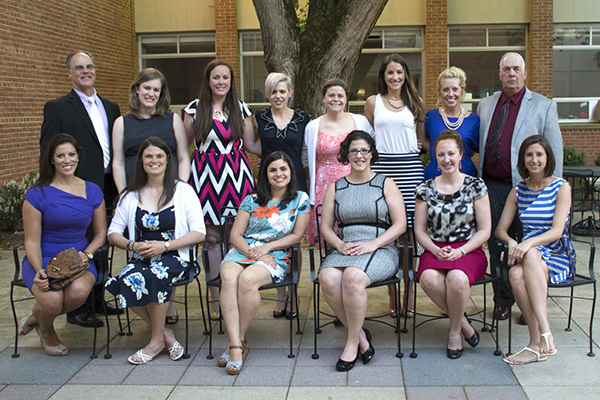 Alumnae nominees must have graduated from the Academy at least 10 years prior to the year the athlete is nominated. Alumnae candidates must have received a diploma from Holy Cross if nominated for individual recognition. Coaches, members of the athletic department, or other athletic supporters who have provided exceptional service and commitment to The Academy of the Holy Cross’ athletic program may also be eligible. In addition, accomplishments after graduation are also considered. The nominee must uphold the mission of the Academy, by being an individual of courage, compassion, and scholarship. 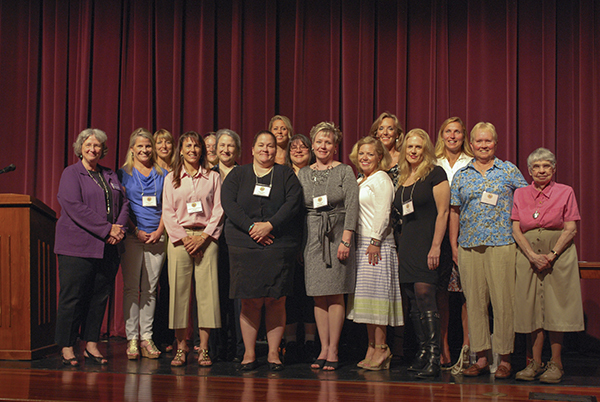 On Friday, May 3, AHC honored the 2013 inductees into the Athletic Hall of Fame. The celebration was originally scheduled in January, but was postponed because of the weather. 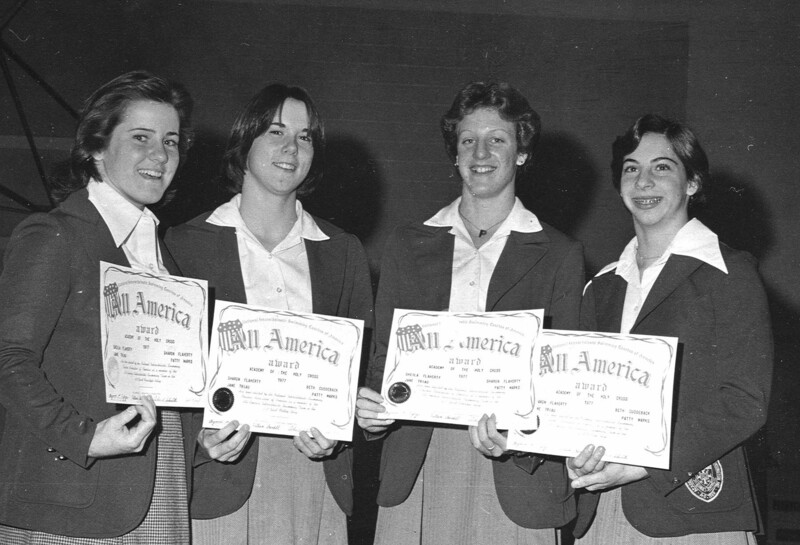 This year, the Academy honored five alumnae, Patricia Marks Briscoe ’80, Elizabeth Cuddeback Glasgow ’80, Sharon Flaherty Jarosz ’77, Jane Triau McDonald ’79 and Sheila Flaherty Stepek ’79, who during their time at Holy Cross were named All-American swimmers. The ceremony took place at a school day assembly with students, faculty and staff. Family, friends and former classmates of the nominees also attended along with former swim coach (and former Faculty member) Barbara Hanrahan. In 1973, the Holy Cross swim team was officially recognized as a member of the Washington Metropolitan Swim League. The team participated in six dual meets with 12 swimmers competing. By the 1978 season, under the leadership of Coach Hanrahan, the team had 14 girls who qualified for Metros. This Swim Team swam to the Catholic League Championship with an undefeated season. That year they also placed 7th out of 71 teams at the East Carolina Invitational. Championships continued to accumulate. Records were set and held for many years in medley and freestyle relays, 100 butterfly, 200 IM, 500 freestyle and 100 breaststroke. Some have yet to be broken. To be named an All-American swimmer is an outstanding accomplishment deserving of the highest honor. Swimmers from every high school in the United States are considered for this prestigious award. The Hall of Fame recipients knew one another before high school because they competed in the summer at their neighborhood swimming pools. Together they decided that it would be fun to swim on the same school team and chose The Academy of the Holy Cross. The Academy of the Holy Cross Varsity Basketball Program celebrated an incredible era during the years of 1975-1982 bringing unparalleled success to The Academy. During this time, Holy Cross captured six consecutive IAABO (International Association of Approved Basketball Officials) Championship Titles, five consecutive Catholic League Titles, and 115 consecutive game wins, a streak that we celebrate today! Those honored as the inaugural Hall of Fame inductees have brought significant recognition not only to The Academy, but to our entire athletic program. The 1975 - 1976 team established our winning tradition under the direction of Coach Bill Sheahan, posting a record-breaking 13-2 season. The following year’s team took the program to the next level with a 27-0 record, winning the IAABO and the CGAA (Catholic Girls Athletic Association) Championships. At that time, the IAABO Championship was the premier tournament in the Washington Metropolitan area, hosting top teams from both public and private schools. The 1977 - 1978 team was the beginning of an era that would ultimately bring national attention to The Academy. The unbelievable 115-game winning streak would include five teams, three All-Americans, and numerous All-Met and All-Catholic conference players. The team remained ranked first in The Washington Post for the duration of the streak. The Sheahan Era is one of incredible distinction and will never be forgotten. Coach Sheahan joined the Holy Cross community in 1975 and immediately established himself as a coaching force in the metropolitan area. Coach Sheahan was truly a visionary-pushing the girls’ game to new heights. On the heels of the enactment of Title IX, Coach Sheahan led our athletes into unchartered territory. During his tenure, Coach traveled with the teams to Europe to play basketball games in Belgium, England and the Netherlands. In addition, he was recognized by Parade magazine and accompanied athletes to Annapolis for recognition by the Maryland State Legislature. Coach Sheahan was instrumental in obtaining basketball scholarships for his players, a legacy that continues today. Congratulations to all team members--the inaugural Hall of Fame class! The Academy is thankful for your commitment to the game, for your outstanding accomplishments, and for your continued support of the mission of The Academy of the Holy Cross.